The BODYGUARD® Slatted Frame is the optimal supporting layer for your BODYGUARD® Mattress. Just like the BODYGUARD® Anti-Cartel-Mattress, the slatted frame is divided into different ergonomic areas. The continuous regulation of firmness and the height-adjustable head and foot sections allow for perfect adaptation to your body. Any body shape can sleep comfortably and safely on the BODYGUARD® Slatted Frame. Whether big, small, heavy or light, and regardless of which sleeping position you prefer. Durable slats provide comprehensive support. The BODYGUARD® Slatted Frame – the perfect foundation for a restful sleep. Simple and fast purchase procedure without intermediaries – all products can be ordered directly through our online shop. 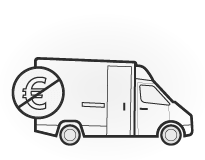 Save time and money – the commissioned forwarding company delivers your order within Germany absolutely free of charge to the nearest curb. For our BODYGUARD® Slatted Frame we use high-quality beech wood, instead of the conventional, cheaper birch wood. Beech wood has a much higher BRINELL hardness according to ISO standards. Birch wood is less suitable starting at a slatted frame width of over 90 cm. The firmer beech gives you 30% more stability with the same degree of flexibility. All wood elements of the BODYGUARD® Slatted Frame are made of 100% real beech. No veneer – no compromises. While both types of wood can be classified in the natural resistance class 5, only beech wood is a class 1 wood in the impregnability classification. This outstanding impregnability allows an ideal defence against wood pests to be conferred during the processing. Consequently, beechwood can be easily converted into the best durability class under DIN EN 350-2, whereas birch, classed as “not durable”, remains in the worst grade. Our BODYGUARD® Slatted Frame has a total height of approximately 7.5 cm. The latest ergonomic research goes into the build of the stable slatted frame. The 42 wooden slats and the ergonomic module areas ensure excellent support and comfort. The BODYGUARD® Slatted Frame thus provides the best support for the BODYGUARD® Anti-Cartel-Mattress and your body. Sleep comfortably and securely. We use beech from sustainable forestry to build our BODYGUARD® Slatted Frame. When selecting our suppliers, we ensure that we use wood from FSC-certified dealers. In doing so, we support the balance between active species protection and the socially aware use of the raw material. All wooden parts are also surface-finished with a resin layer. Instead of the usual plastic caps for anchoring the flexible transverse slats, for the BODYGUARD® Slatted Frame we use only rubber caps. The material is significantly more resistant to ageing than plastic and does not rip over time. After disposal, rubber can be optimally processed into other products and is therefore extremely recyclable. The greater durability of rubber compared to the synthetic plastic also decreases the environmental impact. For more stable processing, we screw the rubber caps into the frame instead of clamping them. With the BODYGUARD® Slatted Frame, the caps for the slats are resting on the struts. This design offers greater stability than an internal arrangement of the caps. Furthermore, in the external arrangement, the slats extend over the entire width of the frame. In this way, at the edges there are no spaces in which the mattress is not additionally cushioned by the slatted frame. And when two slatted frames are laid side by side, an inflexible area twice the width of the strut in the middle of the bed can be avoided. With the BODYGUARD® Slatted Frame, you are choosing a true quality product. There is real craftsmanship here: The frame is firmly screwed to stable bolts, not simply glued, and the rubber triple caps are also fastened in the beechwood frame with screws, not simply tacked. In addition to the movable head and foot sections, six adjustable double slats provide individual resting comfort in the hip area. Order your BODYGUARD® Slatted Frame with one click and bed down on stable craftsmanship.